Wines as varied as the topography and climate of the country enhance the midday and evening meals of most Spaniards. Nowhere else in the world is wine so available, so strong and still so inexpensive. The majority of wines is regional and is found only in the area of their production. Others of a higher quality are sold throughout Spain, and some, on a par with France’s finest, are in demand all over the world. Many millions of acres are under grapes, with La Mancha being the largest area of cultivation. The region’s astringent, light-colored valdapeńas is an extremely popular table wine. Premier wines (reservas), mostly reds, come from the Rioja district north of Madrid. Here grapes of superior vintage are mellowed in wood for at least two years. Others among the better known are the golden chacolí of the Basque country, often hard to find because of limited production, and the heavy toro of Zamora, with an alcoholic content of 18 percent. Galicia’s tart purple ribeiro, low in alcohol, contains enough natural carbon-action to classify as a crackling wine. Málaga and muscatel, savory after dinner, are produced from sweet grapes grown in Andalusia. Locally produced wine (vino corriente) is sold inexpensively in wine stores (bodegas), straight from the barrel. The house wine of restaurants (vino de la casa), served from a pitcher, is usually of reliable quality and costs less than its bottled equivalent. Sherry is made only from vines grown in the chalky soil of the province of Cadiz, chiefly around the town of Jerez de la Fontera. So called sherries from other countries are imitations. Matured by the solera system, drawing wine from a barrel for sale and replacing it with younger wine, ensures a quality so consistent that there are no vintage years. The three main types are finos (dry), amontillados (medium), and olorosos (sweet). Finos and amontillados are generally apertif wines; olorosos are taken after dinner or with dessert. 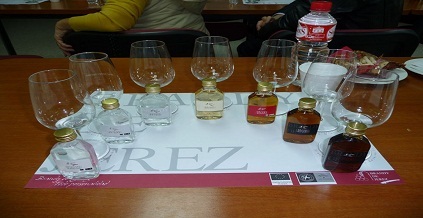 Both domestic firms and companies under license from distilleries in other countries produce brandies (coñac) and liqueurs (licores) in huge quantities. Brandy, a favorite drink of older Spaniards, is quite sweet. Well-known brands are Fundador, Domecq and Soberano, which is the driest of the three. Esteemed Lepanto and Carlos Primero cost considerably more. Favorite liqueurs include Anis, served with ice; Calisay, useful as a digestive aide; and Palo, a very sweet Majorcan drink made from figs. Spain’s superior water produces excellent, German-type brews. Certain brands (such as San Miguel and Aguila) can be ordered all over the country. Others (Málaga’s Victoria, Seville’s Cruz Campo, Granada’s Alhambra), only in the locale where they are produced. Taverns called cerveceriás specialize in serving all three types—light, medium and dark—ice cold. Sangría is the summer beverage favored by Madrileños. This cooling mixture is prepared with wine, water and slices of orange or lemon sweetened with sugar or liqueur. Asturians press two grades of cider (sidra) from apples in the orchards of the North. 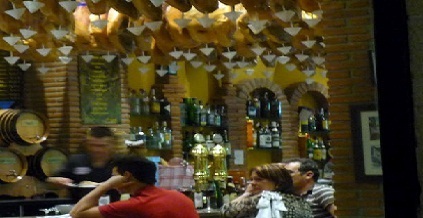 Local cider bars (cedrerías), serve the rough and inexpensive still form by aerating it into glasses from an overhead bottle. Sidra champaña, a more refined, sparkling version, is bottled and sold in restaurants, bars and wine shops throughout the country. Horchata is an immensely popular nonalcoholic drink. Outdoor cafes called horchaterías specialize in serving this milk like libation made with ground earth almonds (chufas) or real almonds. Coca-cola, Pepsi-Cola and Fanta are widely available in bottles or in cans. Tri-Narajus, in lemon and orange flavors, is a refreshing noncarbonated drink. Nowadays water in Spain, at least in the larger towns, is perfectly wholesome. Nevertheless, most Spaniards appreciate the tang and freshness of mineral water (agua mineral), which is available with carbonation (con gas) or without (sin gas).